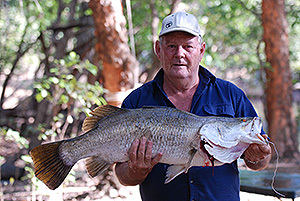 The Normanby River at Pandanus Park has an abundance and variety of fish and is a great place to chase big Barramundi. Set your lines or lure that Barramundi, Archer Fish or even a Sleepy Cod along the banks of Pandanus Park. Be advised it always pays to be vigilant when fishing the Normanby River, as it is home for numerous salt and fresh water crocodiles. NOTE: in Qld an in possession rule applies. A limit of 5 on the east coast of Qld. 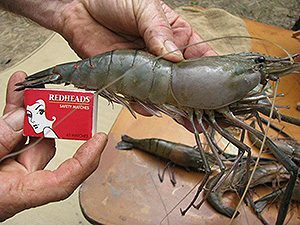 While you are in the north if you go to gulf of Carpentaria the size changes to 60cm min – 120 cm max, Bag of 5. The Barra do strike on lures of all shapes and sizes, after the initial strike that you will remember your lifetime they ''leap' and ''head thrash'' trying to throw that lure, it's now your job to ''keep the tension on ''don't give them any slack, drag up tight. Barra grow to large sizes some well over a meter, legal barra is '58 cm' and must be returned to the water if over '120cm'. The Barramundi is a bastardized name of an aboriginal word ''barramunda'', it is prolific in northern waters both salt and fresh. Barramundi migrates up and down the Normanby River seasonally to breed. Cherabin are a delicious change from normal camp food. Cherabin and special fried rice – YUM! Deep fried and battered cherabin halves, split longways – double YUM! Caught in opera house nets on a bait of dry dog or cat pellets in small bags. TIP: Drilling numerous holes in old white medicine bottles for your bait and attaching these to your opera house make it easier and faster to change your bait. Bag of 10 applies per day per person – .possession rules do apply. 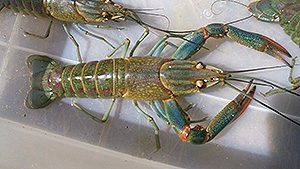 Redclaw are a freshwater crayfish native to parts of northern Australia and Papua New Guinea. Cooking Redclaw: Garlic redclaw, deep fried, smoked or just cooked and cooled – YUM! Caught in opera house trap. NOTE: Females carrying eggs or young must be returned to the water where they were caught.